Social media has been around since the earliest forms of the Internet, with primitive forms of email being developed around the same time as CompuServe back in the 1960s. By the 1980s, social media had become much more sophisticated and real-time and we had Internet relay chat (IRC), an application layer protocol that enabled communication in the form of text. But it wasn’t until the late 90s and mid 2000s that social media really kicked off. The first recognisable social media site, Six Degrees, was created in 1997 and is widely considered to be the very first social networking site. Then, in 1999, came the very first blogging sites. Finally, in the early and mid-2000s came more recognisable social media platforms such as MySpace and LinkedIn, later followed by YouTube in 2005 and the most popular social media platforms, Facebook and Twitter, in 2006. The rest is history. Back then, during the “golden days” of social media, budgets for social marketing were easy to get as everyone was super excited about it. Being on these platforms was an absolute necessity and, in those days, it was much easier to reach people and prove the ROI of all your social media activity. However, today’s social media world is very different. There’s now a plethora of social networking sites, each functioning in a different manner – and it’s considerably harder for you (and your business) to stand out. People don’t see your posts. Due to the various algorithms in place that are designed to favour advertisements, people aren’t seeing as many of your organic social media posts. Social is mobile. Social media is increasingly mobile. In the past it was strictly desktop, but hardly anyone logs into Twitter, LinkedIn, or Facebook via their desktop in 2017. People want video. It’s all about video. Advances in mobile networks and connectivity have enabled people to watch video content on their phones wherever and whenever they want, and without loss in connectivity or speed. Let’s face it, social media as we know it has changed. Social media used to mean Facebook posts and well-performing Tweets, but now it's much more commercialised and all-encompassing. Facebook and LinkedIn now include paid advertising, we have instant messaging applications such as WhatsApp and Facebook Messenger, and there are a number of video and live video integrations that work alongside popular social channels. There’s a dramatic difference between the early “golden” days of social media, where it was easy to get ROI from your social media activities, and the social media of today. Today, social media is hard. It’s no longer possible to simply start up a new social account as a small business, chuck out a few posts and gain traction and engagement from them. You have to work very hard at social media to try and build a community that values and shares the content that you provide. The whole social media process of getting engagement and building an audience requires a lot more effort. However, it’s not all bad; social media is growing. Social media is bigger than ever – and people are spending more time on social than ever before. But the kicker is this; they’re using a variety of channels. As a result, companies have to operate on the channels relevant to their audience(s) and distribute valuable content to those channels. But while social media has evolved, social media tools have been left behind. Current tools offer no real functionality or sophistication beyond allowing users to schedule their tweets in advance – and perhaps get a little look into how those Tweets are performing. However, there is a solution: HubSpot’s social media tools. HubSpot, having rewritten the marketing and sales playbook(s), is rewriting the social playbook, too. It is updating and optimising its current social media tools to make them fit for the 21st century. HubSpot has announced a new integration with Facebook Lead Ads. Facebook Lead Ads are advertisements that you can run on Facebook, allowing you to offer something of value, such as a piece of content, to users. When someone clicks on a Facebook Lead Ad CTA (Call-to-Action), a form pops up which is autocompleted using that person’s Facebook information. The form is completed there and then, rather than redirecting the user to another website. HubSpot’s integration with Facebook Lead Ads will enable you to create Facebook Lead Ads directly from your HubSpot Marketing dashboard. 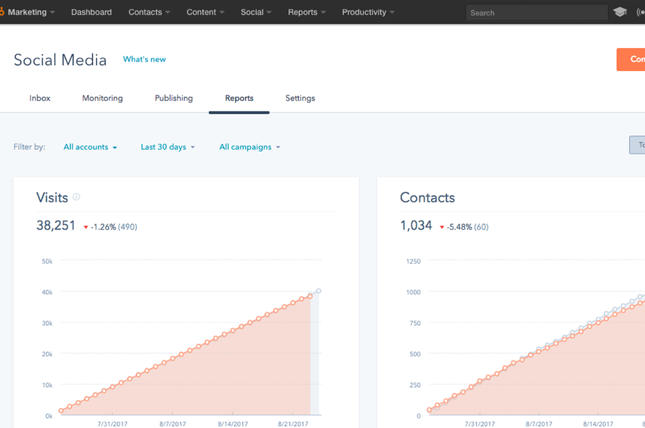 But here’s the cool thing – when you generate leads through this method, the contacts go directly into HubSpot as new contacts, and you can include workflows to start nurturing them as soon as they come in! HubSpot’s new tool will come with the HubSpot Marketing platform and not as an additional paid add-on. For example, you might take your smart prospect list which is always updated, and constantly run ads against these prospects in Facebook. HubSpot’s updates to its social tool will allow you to upload videos and post them onto Facebook via HubSpot, as well as drag and drop videos from your computer directly into HubSpot’s social tool. This doesn’t seem like a groundbreaking update, but this is the first time that HubSpot has supported video via the Marketing software. Previously, if you wanted to post a video to Facebook, you would have had to log in, upload your video and post it through Facebook! What do these edits mean for the future? These HubSpot product updates highlight HubSpot’s focus on making social channels and video tools more accessible to the B2B market. From integrations with Facebook's ads tools, to posting videos via HubSpot into Facebook, we expect HubSpot to be developing tools to work with Instagram, Whatsapp and Facebook Messenger over the next 12 months. As ever, subscribe to our blog to keep on top of the latest HubSpot news and product updates. In addition, if you’re looking for HubSpot Support for your social media management, please check out our HubSpot Support page for more information.